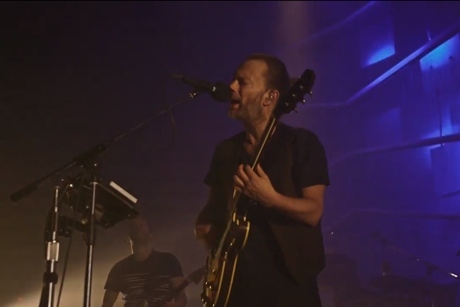 The super-friends in Atoms for Peace began 2013 by releasing their album AMOK, and to cap off the year, we've got live performance footage of their song "Before Your Very Eyes." This rendition was filmed by MTV on November 23 at Studio Coast in Tokyo, Japan. It finds the band locking into a percussive groove, with Flea bobbing around and holding down a nimble bassline while ponytail-wearing frontman Thom Yorke ditches his guitar halfway through to perform some wriggly dances with his arms.